*This post contains affiliate links. Please visit my disclosure page for more details. There were so many wonderful surprises this past week. One surprise was expected and the other was unexpected. The unexpected was a package I received Monday. You see, I had been feeling a bit of criticism from a couple of different sources. My husband and I had taken a long walk Sunday afternoon (just the two of us) and both agreed we were suffering from Plom's Disease: Poor Little Old Me. My husband talks with the kids about this disease all the time, but this time it was affecting us. That is interesting, because normally we have pretty thick skin. After our walk and a good talk we adjusted our attitudes to approach the week in a better way. I also wrote When Being Normal Looks Weird to alleviate some stress. 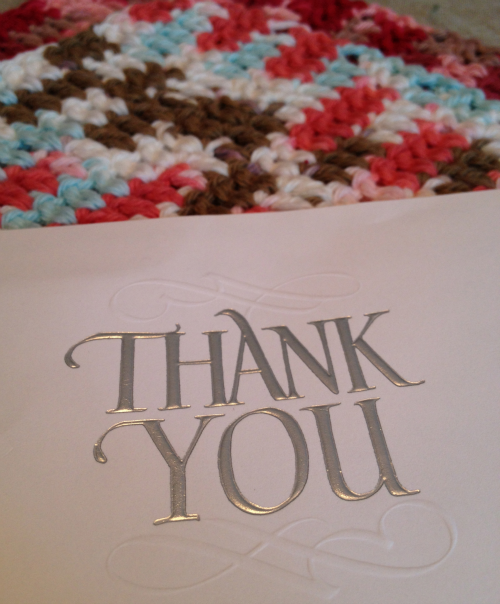 A very sweet reader of Homegrown Learners sent me a thank you note and two knitted dish cloths. She just wanted to tell me thank you for the LEGO resources and encouragement. I stood in my driveway and cried. I came inside and tried to read her note to my kids. I cried some more. My husband came home later that afternoon and I cried again. They were happy tears. Michelle, thank you so much for the encouragement and vote of confidence on a day when I really needed it. 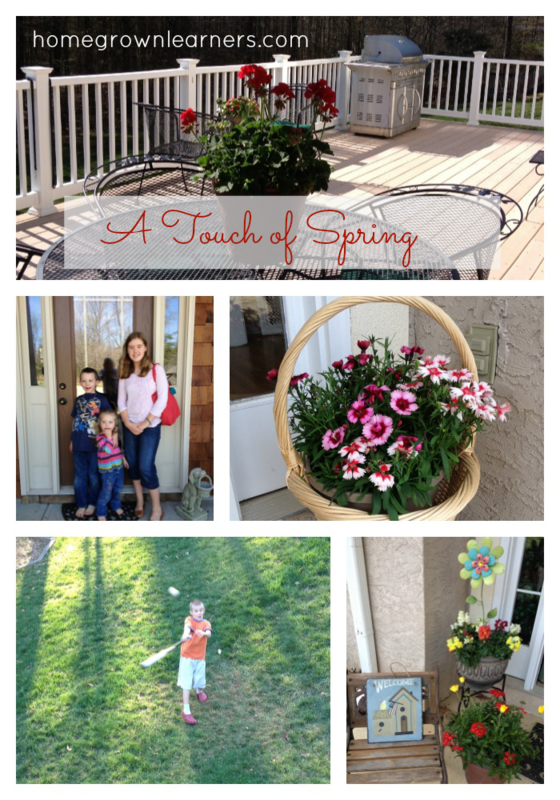 It is because of people like you that I write this blog and share our homeschool journey. You were the Holy Spirit moving in my life on Monday and I'm so grateful. 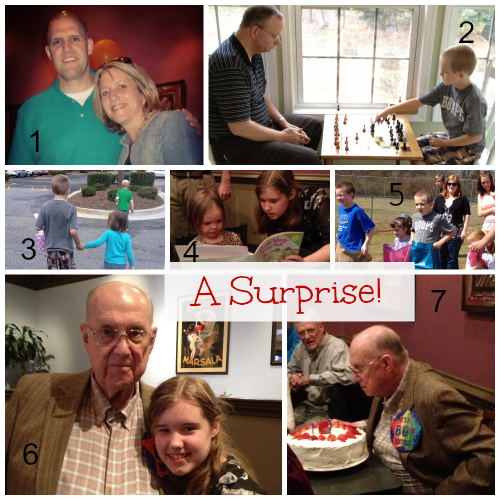 My brother and his sisters have been planning a surprise 80th birthday party for my father-in-law. It was hard keeping it a secret. There was a dinner for lots of family and friends last Friday night, then a barbeque Saturday night for 50 people. 1. A rare picture of my husband and I. We will celebrate our 16th anniversary this summer. I know it sounds cheesy, but he is my soulmate. 2. Grant and his Uncle Chuck played a lot of chess over the weekend. 3. Our niece and her husband live in California. They have a three year old daughter who is sweet and smart. At an Easter Egg Hunt on Saturday she grabbed Grant's hand. It was so sweet. 4. Anna spent most of the weekend babysitting her second cousin, Sophie. It did my heart such good to see them together. 5. Grant enjoyed a lot of old fashioned fun at an egg hunt - I don't think he'd ever been in a sack race before. Check that off the bucket list, right? 6. My sweet father-in-law and Anna. You would never know he is 80 years old. He is so sharp. 7. The birthday boy blowing out the candles! 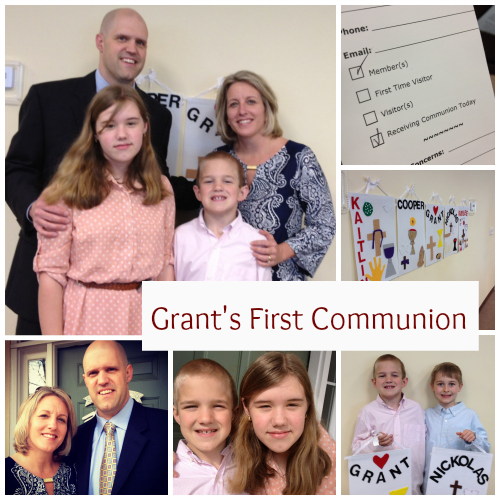 Grant's First Communion was Easter Sunday. I've written before about our church and what a blessing it is in our lives. We were so happy to celebrate this special day with our church family. Each of the children that communed had made a special banner. Grant and his buddy Nickolas proudly posed with their banners after the service. Our children are growing up - pretty soon Anna will be going through Confirmation. Where does the time go? How could I go through a Collage Friday without talking about LEGOS? Did you see the Language Arts and Minifigs download? Since the local schools are on Spring Break this week our library decided to do "LEGOS at the Library", which is a time when children can bring their creations and talk about them with other LEGO lovers. We have a sweet neighbor (who was in Anna's first and second grade class in public school) that also loves LEGOS. He came along with Grant and I (while Anna spent the morning at the bookstore with her aunt) and we had a great time. Grant proudly shared his vehicle that he had made with the Simple and Motorized Mechanisms set. OK. He is loving working with the gears and motors. His car went backward and forward and took quite a bit of time to build. I HIGHLY recommend this set. It is a great investment in your homeschool science and technology curriculum! The beginning of the week was very warm and sunny. The end of the week: not so much. We got done what we could outside Monday and Tuesday, with the rest of the week being a wash. I bought and planted lots of flowers one day. My front porch and back deck have some color now. This weekend my husband will attack the mulch in our yard. Eight years ago when we bought this house we loved the lush landscaping around the acre the house sits on (the second acre is woods behind our home). Now the landscaping is a lot to keep, and we need to dedicate several weekends a year to maintenance. Our deck is huge and it is my favorite place to have school (once the pollen goes away). It looks so bare if it doesn't have a lot of color, though, so I need to find a little more to put out there, without breaking the bank. We set up a bird watching area on the deck and have spotted tons of birds this week! Grant spent a lot of time in the yard practicing his batting. He and his dad have been watching MLB TV incessantly this week. Go Braves! Anna also had her first official "mother's helper" job with a friend from co-op. She worked all morning with a 6 and 2 year old and had a great time. I think we may extend our spring break another week. I have felt so relaxed and accomplished so much this week. I'm thinking if we have some read-alouds and fun activities that may be enough. I have never totally taken a break from school - I mean just NOT thought about school at all. Strangely enough, it feels GREAT. I finished The Homeschool Experiment this week. What a wonderful little book - the author knows JUST how I feel, and it offers so much encouragement. If you haven't read the book, you SHOULD. I literally laughed out loud. I also tried a new recipe for Beef Stroganoff in the crockpot. It was fabulous! Today (Friday) I am taking the kids to The World of Coke in downtown Atlanta. I might be crazy, because the Final Four is in town, but how bad can it be? We're going to meet my husband for lunch (he works 2 blocks from The World of Coke) and call this a mini staycation! I think that's the sum of our week. I've spent little time online and lots of time just enjoying my kids, being their mom (not their TEACHER), and connecting with friends. It has been glorious!